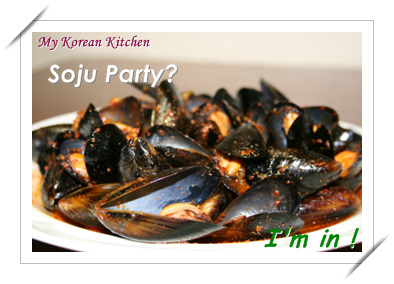 Not that I had a Soju party last night, apparently mussel stew is quite popular as a drinking side dish (with soju) in Korea. Soju is a type of alcohol made with rice or sweet potatoes, originally from Korea. It has a very strong taste like vodka, I would say it feels like industrial or medical alcohol. 🙂 You can read more about Soju from wikipedia. 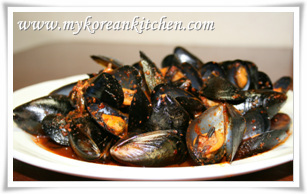 Clean the mussels individually with a rough cloth or brush. 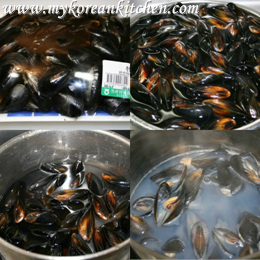 Soak the mussels in cold water for about 1 hour. (Add some salt to encourage mussels to release out any dirt. 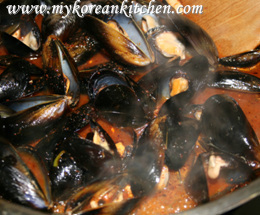 )Drain the mussels in one hour. Pour the water into a pot and boil the mussels. When it boils, scoop out any white froth / debris that may float. Take out all the mussels and 1 cup of boiled water (broth) from the pot. Note: You can discard the rest of the broth or re-use it for other cooking if you want. 1. Pre heat the wok for 10 seconds. Add some cooking oil and the garlic. Stir it quickly. Add the chili flakes and green chili. Stir it quickly. 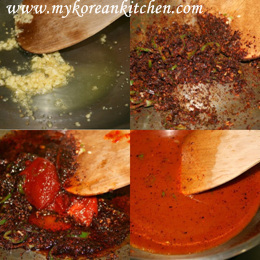 Add the gochujang, honey, and the soy sauce. Stir it quickly. 2. Add the broth (1 cup of mussel boiled water) and the mussel. Simmer it for 3 minutes. Also, here is a suggestion from me. Lots of people mentioned steamed egg as another side dish along with mussel stew, because it dilutes the spicy tastes. So be sure to check out my steamed egg recipe too! Pre heat the wok for 10 seconds. Add some cooking oil and the garlic. Stir it quickly. Add the chili flakes and green chili. Stir it quickly. Add the gochujang, honey, and the soy sauce. Stir it quickly. Add the broth (1 cup of mussel boiled water) and the mussel. Simmer it for 3 minutes. You can discard the rest of the broth or re-use it for other cooking if you want. I am half korean and half english and my mother was from Ulleungdo island where this dish comes from. 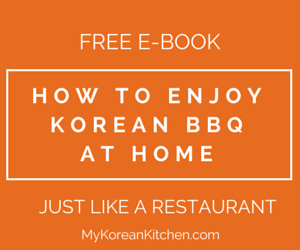 Although i have never been to Korea, I am very grateful that you posted this recipe as it gives me a chance to cook and eat the food of my family. Thank Adrienne for your support. I will do my best to keep up the good work. Thank you for the response. I think it’s just a matter of preference! Since it’s your recipe, I’ll try it your way. I know it kills mussels to soak them in fresh water, but salty water should be okay. Thanks for all the information, and please keep it up! 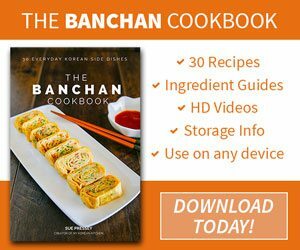 I wouldn’t know what to do with all this wonderful Korean food (or how to find some of it) without your website. What is the reason for not soaking them? Is it really bad if I do so? I just like to soak them, because they seem to be cleaner that way. 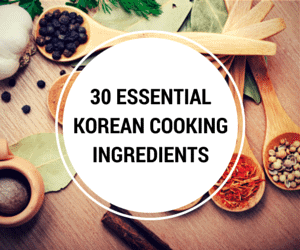 I’ve been trying some of your recipes (just moved to Korea) and wanted to try this one. I’ve been reading up on cooking mussels, though, and lots of people say not to soak them. Is yours just a different method? No, I haven’t tried cooking mussels like in your recipe. But I will try and tell you how it turned out. this looks quite spicy, but must be good on a cold night.